Sometimes, all you need to feel remarkable, is a singular stand-out piece. 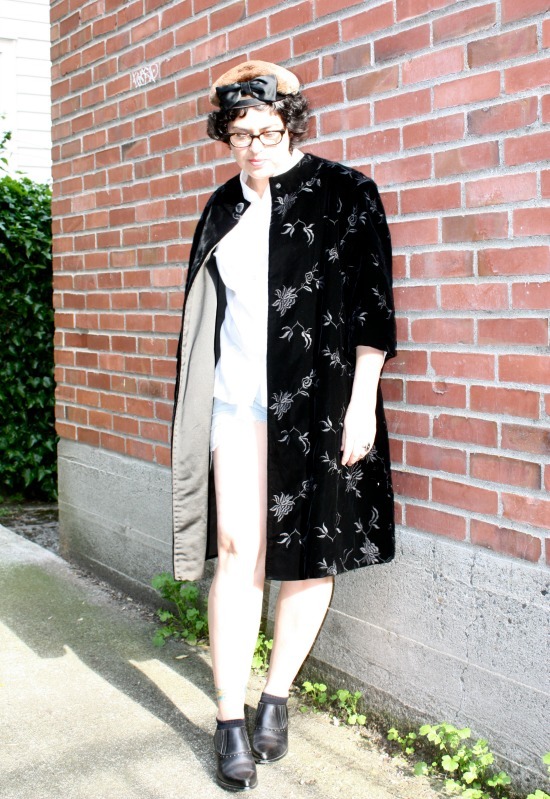 And this vintage velvet coat was just the ticket. When they say "they don't make 'em like they used to," those "theys" just may have been talking about this jacket. It is, quite simply, a quiet beauty. Simple neckline, a single snap closure, fully lined in a black silk. The velvet itself seems to be made of silk, and the floral embroidery on it, turn this midnight gem into a stellar work of art. The coat was donned on impulse- I needed something to keep me warm in the shade but not to overheat me in the mild Pac-Nor-West sun. So when I trotted off to check out the grand opening of the Chrome store in downtown Seattle, (more about them later this week) I realized it was the perfect garment to give me a little oomph to my somewhat blend-in jean shorts and white cotton blouse. It must have been "oomph" enough, because when I stepped inside the cool San Fran based store, I was greeted by the party's host saying, "Hello. You must be a fashion blogger." Fashion-wise, what I love to wear and write about, are garments just like this velvet coat- clothing that is made with an attention to detail and quality. Unfortunately, the coat doesn't get to preside in my personal wardrobe, but is instead, in line to getting listed on Etsy. It's in primo condition, and will be a stand-out piece to someone to own. Gorgeous coat. It's got lots of style. oh yeah, that jacket is divine! Thanks for sharing with Visible Monday, xox. Vintage coats are my Kryptonite; I cannot stop buying them. They really are just amazing. What a gorgeous coat! I do love velvet. I hope the person who buys it is a style blogger and someone with a fabulous hat collection. That is a beautiful coat - I don't think I could let that one go. Like you said, they just don't make 'em like that anymore. Wow! That is some coat! It's almost a work of art it's so beautiful. A stunning coat on a stunning person. You do wear it so well! Thanks for showing us. I seem to be into velvet at the moment! Silk velvet is such a sumptuous fabric. Love the regal nature of this jacket paired with the shorts underneath. I just wouldn't be able to part with it! I know, I know ... you can't keep everything you look wonderful in. But you should put this in your closet. At least through next winter... you, long gloves, any dress or under thing you want, hat, fab shoes. Lovely. I was tempted as indeed the coat is gorgeous. Even went to your Etsy shop (... I know... You said "inquire after sales details.." . I find I always rely on a great jacket or shoes to disguise the fact that really I'm just wearing jeans and a tshirt!